Cathy & Brett - Perfect Pastels, Lego Men & Magic Wands! Today we bring you the story of Cathy & Brett's beautiful wedding which took place at the end of May this year at the very lovely City Hall here in sunny Sheffield. When Cathy & I met at a wedding fayre last year, we talked briefly about how she wanted really pretty, soft, feminine pastels in whites, creams, apricots and blues. Once we met up for a consultation we also talked through her idea to use silver as an accent colour too. 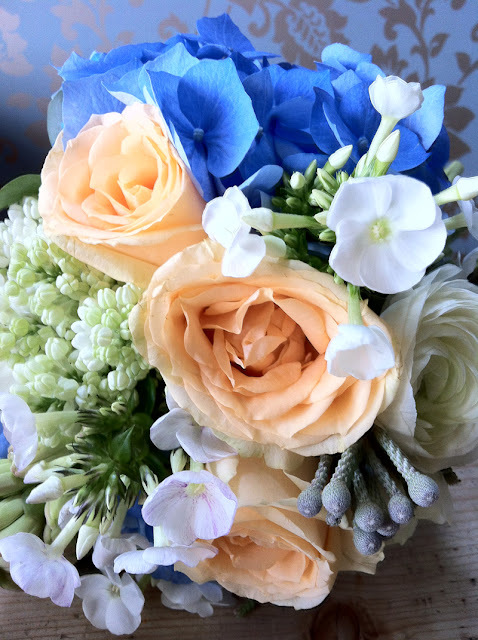 It didn't take long to choose a stylish bouquet of soft pastels, hand tied in a posy style using blue hydrangea, creamy, scented tuberose, white ranunculus, silvery brunia, white phlox and ‘Finess’ (apricot coloured) roses. We also decided to conceal the binding point with a band of silver satin ribbon with a lace overlay to pick up the 50's styling of her gorgeous ivory satin gown with a silk georgette beaded overskirt. We also secretly decided to incorporate some really personal details in the shape of a really fab lego man in Cathy's sons buttonhole and a funky little union-jack guitar lapel pin badge into Brett's buttonhole. Just before the wedding, Cathy dropped these off with an extra little lapel pin which she asked to be put into her Dad's buttonhole. I have to admit that it made me shed a tear when I saw it and, indeed, it had the same effect on Cathy's Dad too, apparently! 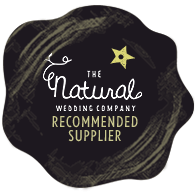 Well, with the lovely Becky & Mark's wedding done this week, it's all set to be a weekend of consultations and meeting lots of fab new brides. 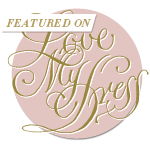 This week Kate & I also made some fantastic new blogging friends in the shape of Lou from Whimsical Wonderland Weddings and Julia from Brides Up North, both of whom featured our work, which was just so exciting! Sammy & Harry - Spring Scented Hyacinths & Nobody Home! Whilst Kate and I get on with lots of exciting plans chez Campbell's, I thought I'd take the opportunity to catch up with some of this year's totally fabulous weddings, beginning with the Spring wedding of Sammy & Harry. Sammy, it has to be said, is probably one of the most laid back lovely Brides I've ever worked with. Recommended to me by my lovely friend Amy from Pure Enough, Sammy and I hit it off straight away. When she told me that her bridesmaids were wearing royal blue and that she was to be married in mid-March, I just knew that hyacinths were going to be a feature of her flowers! On talking everything through, we decided on very natural, soft and pretty posy-style bouquet with a 'hand picked' look in lovely whites and creams for Sammy, using blooms such as cream ‘Vendella’ roses, white ranunculus, white hyacinths, white spray roses, cream wax flower, rosemary and eucalyptus cinerea. As a pretty embellishment we decided on a cream satin band overtied with a narrow blue satin ribbon in a bow with short pretty trails. For the four adult bridesmaids we created similar bouquets but added a lovely depth of colour by replacing the white hyacinths with gorgeous Delph Blue hyacinths instead. Beautiful. We also decided upon a tiny version of the Adults' bouquets for Bethany, her flower girl. On the day, all went well and off I set in Dory to deliver a van full of scented goodies. 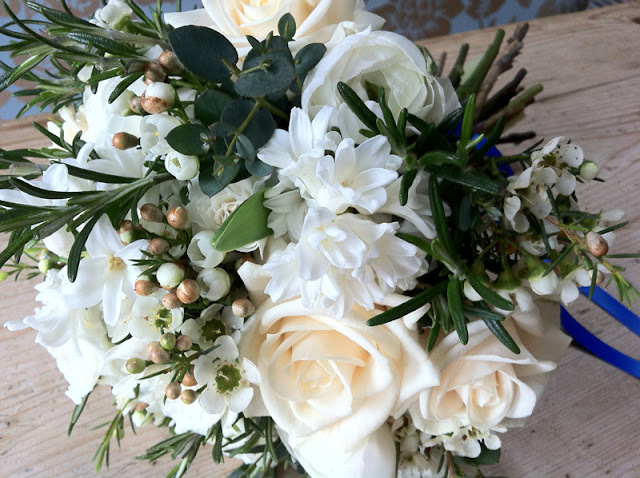 Unusually, I had arranged with Sammy to deliver all the buttonholes to the guys first (purely because geographically it was easier and quicker) - imagine my surprise when I got there only to find no-one home! Some odd things can happen to a flowery person on peoples wedding days, but delivering to an empty house was definitely a first! Anyway, a kindly neighbour came to my rescue and managed to locate them all and they turned up not long afterwards! Everyone loved their flowers and the bridesmaids were just blown away by the gorgeous scent of those amazing hyacinths. You just can't beat Spring flowers for a Spring wedding! 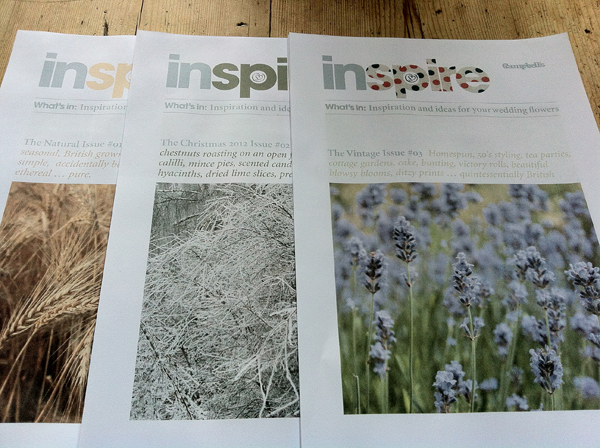 Inspire Style Guide Issue #3 'Vintage' - is out now! 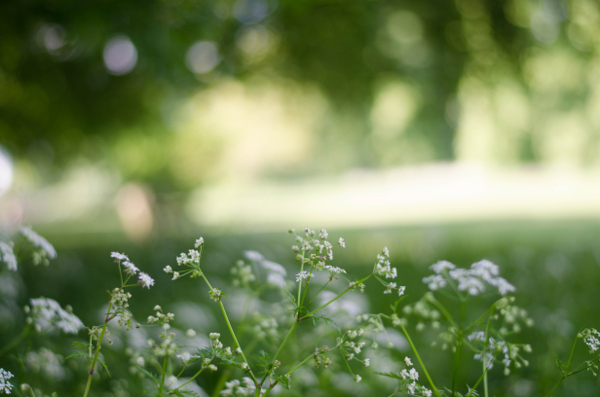 Hope you're all enjoying the fabulous sunshine - here at HQ, we're just loving the weather at the mo. 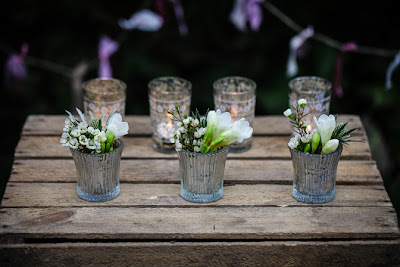 All the really pretty summery flowers are now starting to show their faces again and we'll be bringing you cornflowers, scabious, campanula, stocks and much, much more very, very soon in all the gorgeous weddings we have organised in the next few weeks. In the meantime, we're absolutely delighted to bring you another issue of our pretty, pretty style guide, Inspire, and this time it's entitled 'Vintage'! It's jam packed full of all kinds of gorgeous blooms, brimming with ideas and inspiration and just perfect for those of you planning a touch of retro loveliness on your wedding day. And, if any of you missed out on earlier issues, do get in touch and either Kate or me will be only too happy to whizz off a quick PDF to you. 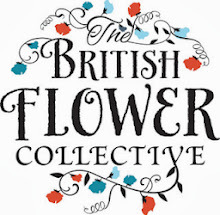 Today, we are beyond pleased to bring you news of a really exciting new venture which means we will be working really closely with the very fabulous Julia of Go Glorious. 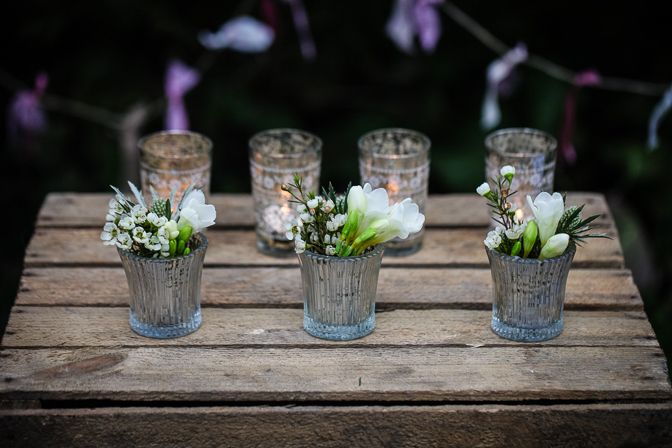 The upshot of our latest collaboration means we'll be able to offer our lovely Brides all kinds of extra gorgeousness - think grand urns, stunning candleabra, pearlescent pretties, mercury glass gorgeousness, golden place settings and so, so, much more! Once upon a time, a few moons ago, I met a lovely florist lady in my local pub. A few moons after that, I got in touch with her again, as I thought her work was just brill. I could see that Tracey Campbell knew her onions and had a fabulously creative mind. I wondered if there was a way we could work together. I was so glad I did. When two like minds meet, exciting stuff happens. Tracey is an inspiration. We’ve had lots of meetings since – and there’s all sorts of ideas bubbling away to be brought to you over the coming months. But first and foremost, we have come up with a cunning plan to work collaboratively. A core element of my business is prop hire. So – way to go. 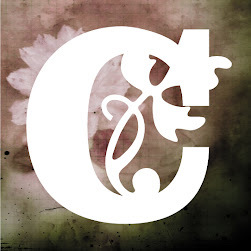 I order and store muchos floral container finery. 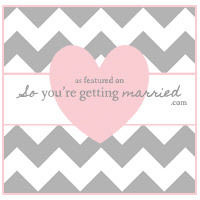 Tracey hires said gorgeousness from me, and is thus able to offer brides far more choice. It also means that Tracey can compete better in the corporate market, as she now has access to the sort of mahoosive vases that venues like the Millenium Galleries require. But variety is the key. From pretty little votives to terracotta pots – all of it will be available.